how to set new variable for each cycle? 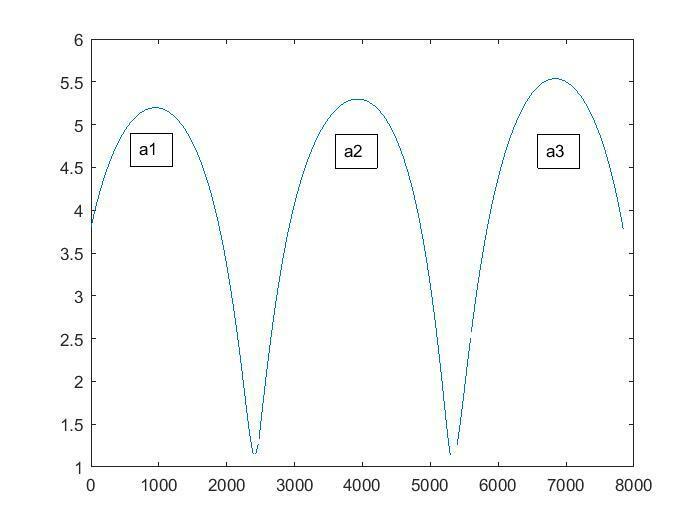 The figure shows the data of the form sine wave. Now, I wish to define one new variable (e.g. a1, a2, a3) each corresponding to one cycle? Is it possible? "Now, I wish to define one new variable (e.g. a1, a2, a3) each corresponding to one cycle?" The MATLAB documentation specifically advises against doing this: "A frequent use of the eval function is to create sets of variables such as A1, A2, ..., An, but this approach does not use the array processing power of MATLAB and is not recommended. The preferred method is to store related data in a single array"
It is much simpler and more efficient to use indexing. You should use indexing. Get the indices of the least values...and you can divide/ name your data. Read about min, findpeaks and logical indexing. However we recommend against using separate variables for this. @KSSV and @Walter, sorry, I could not exactly understand your suggestions. However, I found some other way to solve this problem.